Fat LossFOURPLUS 4+ ThinFat+ - 120 kaps. FOURPLUS 4+ ThinFat+ - 120 kaps. 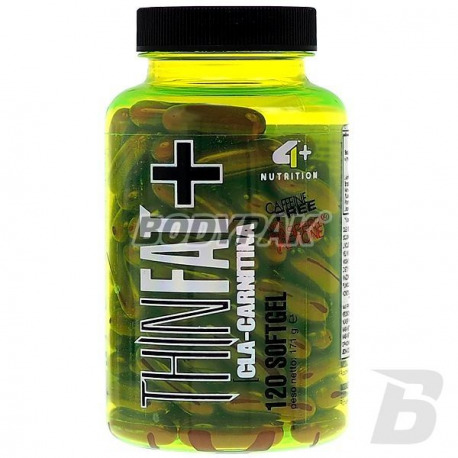 With a unique combination of L-carnitine, CLA and raspberry ketone works as an effective adjuvant burning excessive body fat. 4+ ThinFat + thanks to a unique combination of L-carnitine, CLA and raspberry ketone works as an effective adjuvant burning excessive body fat. CLA (Conjugated Linoleic Acid - conjugated linoleic acid -) is a modified fatty acid present in small amounts in food. The use of CLA as a dietary supplement helps in fat tissue reduction (inhibits the formation and growth of fat cells), improves vitality, and increases the body's energy reserves. L-carnitine is a natural substance called Vitamin BT. It is particularly important in regulating the level of lipids in the body. The use of L-Carnitine before physical exercises activates fat, making it immediately converted into energy, resulting in almost double amount of calories. 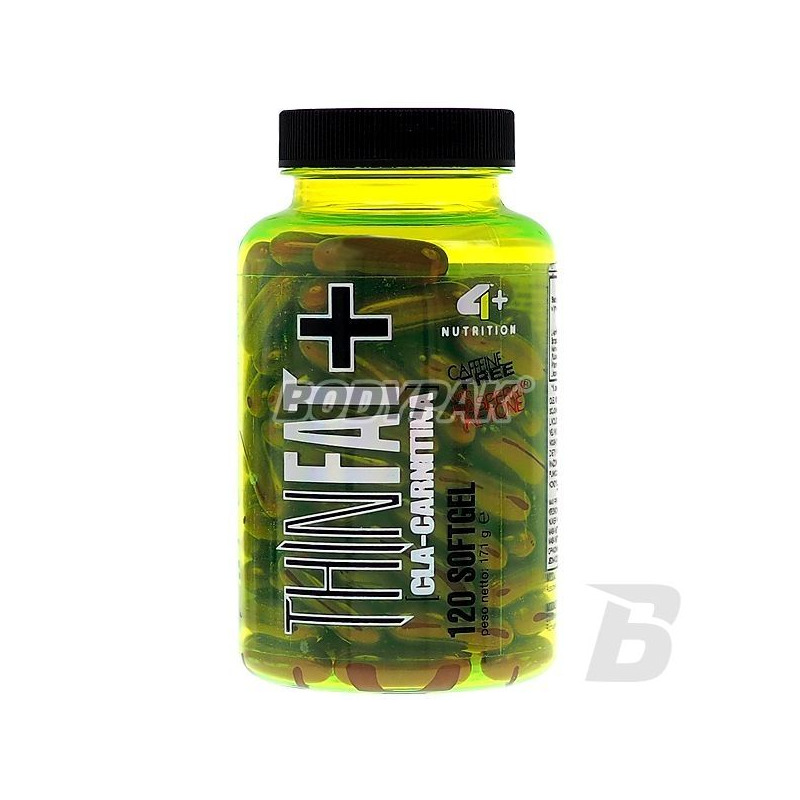 The use of L-Carnitine prevents tiredness, reduces regeneration periods after physical exercises, increases overall output of organism and significantly reduces fat cells preventing the appearance of yo-yo effect. It increases basic training parameters, ie. Aerobic capacity, strength, speed and muscle mass. Amino acids L-arginine and L-ornithine intensify the effects of L-carnitine effectively increasing the breakdown of body fat. L-carnitine works best in tandem with exercise. Raspberry ketone, aromatic compounds that are found in red raspberries. Their presence has been known for a long time, because for a long time they are used in the cosmetic, perfume and food industries. But reports of weight loss properties of raspberry ketones appeared relatively recently. Generally speaking, raspberry ketones are responsible for the inhibition of weight gain, speeding up metabolism and increase body temperature. So we can say that they act like other thermogenics. The more that the structural features of raspberry ketones is similar to the structure known and used in the slimming lipolytic compounds (eg. Capsaicin, synferyna). Raspberry ketone is a compound which regulates the level of adiponectin, a polypeptide hormone that is produced and secreted into the blood by the mature adipocytes. Low level apipodektyny is regarded as a factor leading to the development of type 2 diabetes Increase the apipodektyny by taking pills containing raspberry ketones significantly reduces the degree of obesity in people who have undergone such treatment. Raspberry Ketones are also responsible for regulating the level of noradrenaline, which in turn leads to a slight increase in the overall temperature of the body and speeds up the weight loss process. The actions of raspberry ketones is confirmed by tests carried out on mice They made their scientists at Ehime University School of Medicine. Rodents they were at a high-diet for 6 weeks. Then the diet was enriched with raspberry ketones and lasted for the next 5 weeks. The effects were surprising. The addition of raspberry ketones caused the mice did not build up abdominal fat, and at the same time prevented the negative impact of high-fat diet on the liver. Who is dedicated THINFAT +? The perfect supplement supplementing the diet effective dose of L-carnitine, CLA and ketones raspberry is dedicated to all active fizycznieosobom adults seeking to reduce the level of subcutaneous fat, or who want to keep their body weight at the desired level, as well as anyone who proactively want to support the work cardiovascular, dismissing the risk of coronary heart disease and other cardiovascular diseases. Inne składniki: olej roślinny, żelatyna - otoczka kapsułki, lecytyna sojowa, glicerol - emulgatory.